We are getting some new equipment. The new rug is just the beginning, but already such a success! 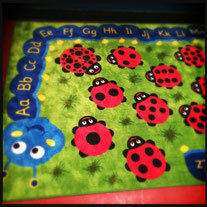 The children love finding their name letters and counting the spots on the back on the ladybugs.